I believe I’m like most average people in that we all have moments in life that test the strength of our emotional resiliency. Beloved family members or pets pass away. Friendships fall apart. Love interests lose interest. Illness, injury and a host of other tragedies, big and small, rock our worlds from time to time. One adage says that we are only given what we can handle. 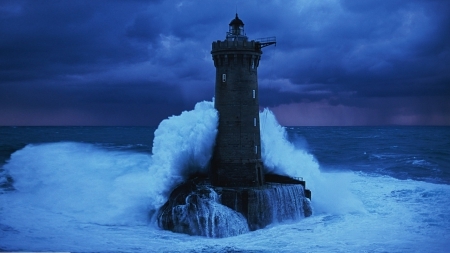 Often when these situations arise, and those around me are breaking down, I equate myself to the lighthouse on the point absorbing the brunt of the storm. Yesterday, once again, I found myself in the position of someone who was “the Rock”. A coworker who I’ve grown to like over the months for her generous and kind heart, recently suffered the breakdown of a romantic relationship. While she, like I, am a bit cagey on some details of her life, I knew something was up earlier this week. Last evening as we were closing up the office, I inquired if she had any fun plans for the weekend or if she was going to lay low, read and watch movies; it was then that she broke down. The pertinent details came out and while she tried to hold back the tears they wouldn’t be denied. I opened my arms and with a tilt of my head I asked, “… need a hug?” She did. We hugged. She cried, and apologized for crying, and then cried some more. I told her it would be okay. She said she knew, but it still hurt so much. I understood. I believe that adage, the one where we are only given what we can handle. My past has shown that I will stubbornly stand against the waves of each storm that comes my way, letting them crash and wash over me, if only so I may continue to shine my light for others. This entry was posted in Blogging, Fancy Coffee Friday, Personal and tagged Annie Proulx, Brokeback Mountain, emotion, emotional, emotional rock, Fancy Coffee Friday, lighthouse, quotes, resiliency. Bookmark the permalink. Your co-worker is lucky to have you for a friend but most of all someone who understands!! Not all friends have your inner strength !! Thanks! I try to be a decent human.